Today I would like to introduce you to one of my April sponsors Laura Emily of Good Earth Living. I suppose I could say I’m 25, but I feel more like 75. A Baba Yaga of sorts. Raised in the Pacific Northwest, I’m quite literally surrounded by nature and volcanoes which have inched their way into my being. I preach holistic health and honesty, returning to simplicity and the basics. When I’m not tending the fire or flaming the prayers, I’m pretending to be a donkey kong professional with the love of my life, Mr. Husband, the strangest man I’ve ever met. The current blog I’ve kept up or almost a year now. I write for myself. To reflect and question what is going on in my world. I love sharing those thoughts for the moment when someone says, “me too.” Opens the walls of isolation just a bit further each time; communion with women. Tell us about your Etsy shop and the wonderful products you sell. After being sick with what the doctors called an incurable disease for almost five years, I found healing in raw foods and herbs. The last test confirmed that I no longer have such said incurable disease. Thus a passion was lit! Now I grow and create my own herbal remedies that I sell in my Good Earth Living etsy shop. Nature provides us the best; I just repackage it, really. Guiding souls in making the best choices to address their physical and medical needs with nature’s remedies is my passion, and I aim for Good Earth Living to carry that intention in every order. Of all the products you sell, which is your favourite and why? Spirulina. Spirulina changed my life, and just about every soul I’ve ever given Spirulina to! Spirulina is the super-food of all super-foods. Just a few capsules in the morning (or sprinkling in your favorite green smoothie recipe) will lend energy and clarity with no crash or side effects. If you’re sick? Take Spirulina. If you’re exhausted? Take Spirulina. If you’re depressed? Yup, Spirulina! It’s a whole food staple- safe and effective. It can be taken with any medication or health related issues. It isn’t just another supplement- it’s a life changer. You just finished leading a group of woman on a 10 day fast, how was that experience for you? Tell us a little bit about the next fast you are leading? Fasting pulled me out of the depths of disease, depression, and being without direction- sharing and cultivating that experience with other women was amazing. Women circling together- be it a virtual circle- to support, hear, and work out their own personal soul work together is liberating. It is open to all religions, personal beliefs and intentions for fasting. The next group will be circling in August- when fresh produce is at its peak for juicing. Fasting from all solids is NOT required. You can fast from meat. Fast from television. Fast from all cooked foods. What your fast looks like is up to you- I just provide the group, support and guidance. Registration for the August fast will open up April 15th and will close July 10th. More info can be found at my personal blog. I preach it so often, I’m sure everyone is sick of hearing it: a hot bath! I don’t care what the ailment/stress is- I can always afford a hot bath- and it will always help. 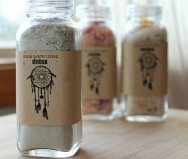 A salt bath; especially with added herbs and oils to detox, to restore, or to center. Pull out the fire pit- granted that it’s not raining here in the Pacific Northwest. Our backyard is about twenty acres- a giant meadow circles by evergreens. Sitting by the fire, tending my herbs, and watching the coyotes - this is heaven on earth for me….a quiet slice of solitude and simplicity. Thanks so much for taking the time to share a little bit about yourself with us. It was wonderful getting to know you a little better Laura Emily. To enter today's giveaway, leave a comment , one per person, below. Giveaway is open until Thursday April 19, 2012 at 7pm. I will draw a winner after this time and announce it in this post. Thanks so much Laura Emily! And, do stop by her Etsy shop and pick up a little something for yourself for Mother’s Day, you deserve it. Laura Emily is offering a 15% discount on all orders until May 13, 2012 with the code MINDFUL2012. I promise you will love her products. "i was JUST talking about spirulina! i need some!" What a wonderful giveaway!! Thank you for the offer!! A great interview and giveaway! Thanks Laura Emily and Kim! What a great gal! I'd love to win. Great post! So much inspiration! Detox baths and clay masks work wonders! What a wonderful post and giveaway. Thanks Laura and Kim! Love this giveaway and also the discount offer - very generous. Just checked out Laura's products and they look wonderful. What a lovely giveaway. Would be perfect just in time for Mother's Day this year. Great post! I'm definitely going to check out her products. Please enter me in the give-away! Thanks! I love Laura Emily! Thanks for the opportunity! i was JUST talking about spirulina! i need some! a Lovely giveaway. Thanks for sharing!